For the first time in its 120-year history, the environmental group Sierra Club engaged in a civil disobedience action. 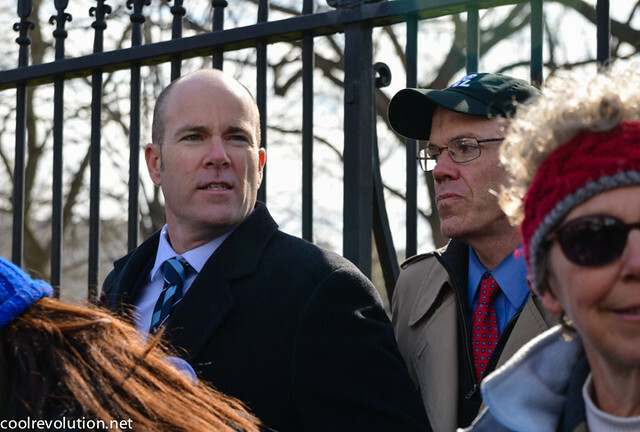 Allison Chin, President of the Sierra Club Board of Directors, and Executive Director Michael Brune lined up in front of the White House to be arrested for obstruction along with 46 others activists. Many of them were also leaders of fellow environmental advocacy organizations, such as Rainforest Action Network, Earthworks, Friends of the Earth, Natural Resources Defense Council, Greenpeace and 350.org. “We have joined the ranks of visionaries of the past and present to engage in civil disobedience, knowing that the issue at hand is so critical, it compels the strongest defensible action,” said Brune. I think what’s behind it is fear. We have built an economy that is based on fossil fuels, and people don’t know what the world can look like when we move off of those fuels. People who deny climate change obviously haven’t looked at the science, they haven’t had a candid, honest, thoughtful conversation with someone who has studied this issue, and they fear for what a transition will mean for their lives. So what we say to them is that the clean energy solutions that we’ve been talking are being put into place right now. Iowa gets almost 25% of its power just from wind. South Dakota the same. California will soon get 30% of its power from solar and wind. We’re just getting started. We’ve quintupled the amount of solar energy that’s being produced in the us in just the last four years. Wind energy has doubled in the last four years. We know in our generation we’re going to build an economy based on power that’s clean and renewable, and it will put more people to work. It will increase our quality of life at the same time. Is global warming at the point of no return? No, I don’t think so. I think that we are on the cusp of a clean energy revolution in the United States. We’re seeing a resurgence of grassroots activism that’s stopped a 175 coal plants from being built, that is exposing the dangers of fracking, that has slowed mountain-top removal in Appalachia, that’s secured the retirement of 137 existing coal-fired power plants. So we have a movement of people who are fighting for clean energy, they’re winning, and we’re building momentum. and to invest in solar and wind with all of his might and ambition instead. Under the Robe: Ignorance and Want in "A Christmas Carol"